Episcopalians seek to worship Jesus Christ in the pattern set out in the Book of Common Prayer. Our worship is centered around the Sacraments of Baptism and Eucharist and other sacramental rites of the church. We say (and pray) the Creeds in our principal worship services on Sunday. In The Episcopal Church, we are called to live out our faith on a daily basis, whether we are at home, school, work or recreation. The cornerstones of our faith are Scripture, Tradition, and Reason. 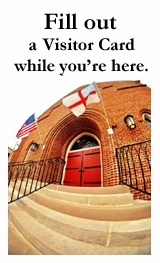 The Episcopal Church itself is part of a distinct Christian tradition called Anglicanism. The Episcopal Church is one of the 38 member churches in the Worldwide Anglican Communion, a fellowship of 80 million Christians across the globe, in over 16 countries. This unique approach to Christian faith is sometimes called fully catholic and fully Protestant, but in many ways Anglicans differ from other Protestant traditions and Roman Catholicism.